Last Saturday I was involved in a really interesting conversation on the subject of "The Customizable Body: The Present / Future of Identity" at the Yerba Buena Center for the Arts. The featured speakers were Second Life founder Philip Rosedale and photographer Amos Mac, documents trans male lifestyles in his zine Original Plumbing. I love events that juxtapose seemingly disparate topics like transgender photography and virtual worlds. It became a wonderfully free-form and honest mash-up of ideas and experiences that the 80-some people there really engaged with. I think it helped that Rosedale and Mac are such winning personalities with unique and fresh perspectives on technology and identity. And that their interlocutors Tom Boellstoerff and Michelle Tea were so skillful at teasing out the most interesting ideas and opinions from those two. 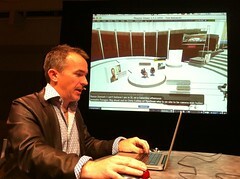 It was also a nice use of the mixed-reality, as the event was beamed into the Metanomics virtual talk show space and then projected onto a big screen. So the avatars could see the humans and the humans could see the avatars! I won't attempt to summarize what Philip and Amos talked about, since it was a rather free-ranging discussion. Hopefully someone else will make available video or notes from their talks. Check out Amy Higgin's neat Storify of the event, that mashes up different images and tweets during the talks. My main takeaway relates to how technology affords humans expanded means of expression, personal development, identity exploration, and connections with others. And it let's a shy, short middle-aged dude become the dancing bot he always dreamed of. Amos Mac is doing what at its face is a fairly simple thing: he is photographing trans male persons as they truly are, and offering them a space to just express their real life experiences and perspectives to each other, in a print publication. And yet that simple act can have repercussions throughout the transgender community, the larger queer community, and perhaps the world at large. Photography affords a certain form of both raw and constructed expression, questions ideals of physical beauty for men and women, and celebrates a lifestyle that for many people in this country is "radical" and even dangerous. Second Life as a technology also affords people the opportunity to express themselves, and perhaps even represent a truer form of themselves than their physical bodies might manifest. The body is fluid, malleable, and insubstantial. If you can easily change your appearance, your gender, your face, your species, whatever, in a virtual environment, how does this impact how you see yourself in the physical world? The small but significant transgender community in Second Life is the most direct example of an online space for people who are exploring their identity to be with others who are supportive, welcoming and understanding of what they are experience. But the same could be said for the disability communities, veterans suffering from PTSD, people on the autism spectrum, and diasporic ethnic groups that find connections with each other through Second Life. It's just a great tool for deep, sustained engagement with like-minded peoples that goes beyond discussion forums, Facebook groups and microblogging. And each person in Second Life has the opportunity every day to recreate herself. It has been interesting to observe how my Second Life persona has informed my "real life" identity. Unlike a lot of my Second Life friends, I have no firewall between my virtual self and my real life self. One of my typical avatars wears my actual face. My birth certificate name is in my Second Life profile. And my blog has a picture of both me and my avatar. That said, I think my Second Life persona is in some ways my best self. He is confident, a natural leader, witty, and cool. He's the best dancer and a smart dresser. When he walks into a room, everyone wants to be his friend. His favorite avatars are a funky dragon, a breakdancing robot, and a cyborg with his electronics poking out from his skin. In real life social settings, I have more quiet, introverted, even wallflower tendencies. I angst about my dancing ability, I fuss over my wardrobe, and can't decide how I feel about my hair. So when I feel a pit of anxiety building in my gut like a bowling ball, I can close my eyes for second and remember that my Second Life and my first life are really all just ME. I can put on one of my avatars and walk confidently into a crowded party, a first date, or a networking social. The breakdancing android has just arrived.